One of the most significant inventions of the 20th century is that of the contact lens. Spectacles were always considered unwieldy and unattractive. The contact lens was invented as the better alternative. Even though the concept of the contact lens saw light as early as in 1508 (Leonardo da Vinci), a commercially viable prototype appeared more than 300 years later, in 1936. So what is it that makes contact lenses more appealing? There are so many aspects to this question - let us examine each of them, one by one. The only case for spectacles is that they are easier to maintain. Contact lenses are more awkward to transport and need constant cleaning and disinfecting. One has to carry solutions, sterile cloths, sets of lenses and so on. But with spectacles, all is needed is the spectacles and the case. The stringent hygiene needed for contact lenses is not applicable to spectacles. Positive appearance: People who wear spectacles are often a subject of ridicule, especially among the younger generation. By switching to contact lenses, this hazard is eliminated. Functional advantage: Contact lenses are very convenient for sportspeople. They also are very useful as a visual aid in extreme environments such as in a humid area. Peripheral Vision: This is better through contact lenses rather than through spectacles. Spectacles - a cumbersome attachment: : Only a person who wears spectacles can know the inconvenience of wearing them. Spectacles become blurry due to perspiration and body heat. They pinch the nose, and slide down it from time to time. They tend to pick up splatter during rainfall. None of these difficulties exist in contact lenses. Natural Vision: Contact lenses offer a natural vision the way spectacles can never achieve. Vision through spectacles is such that sometimes objects do not appear at the correct distances nor do they seem to be their actual size. Natural appearance of the eyes: With contact lenses, the appearance of the eye does not change. In fact it is difficult for someone to make out whether a person is wearing contacts or not. However, with spectacles, especially with high-power lenses, the eyes tend to look distorted and magnified. Bright conditions: If the environment is very bright as in tropical and sub- tropical countries like India and Australia, sunglasses need to be worn. It is not possible when vision-corrective spectacles are required. But shades can be worn over contacts with no problem at all. Miscellaneous jobs and functions: There are a number of actions which get hampered through wearing spectacles. You cannot lie down and read comfortably. You cannot fit a headband, cap or helmet easily. Even before you play with a child or a pet you have to be cautious. Wearing contact lenses will enable you to do all these easily. So these are a few of the many reasons for wearing contact lenses over spectacles. 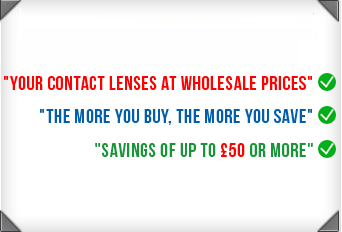 If you are able to, contact lenses are a great option for comfortable visual corrective wear.